Maty Ba Diao is an Agriculturalist and Animal Husbandry Expert at the National Laboratory for Livestock and Veterinary Research (LNERV), Senegalese Institute of Agricultural Research (ISRA), Dakar, Senegal. Community-based natural resource management helps integrate livestock into production systems without detriment to the environment. Forest reserves in developing countries are threatened by many factors – climatic fluctuations, agriculture, logging, livestock farming, poaching and uncontrolled fires are only some of them – and the loss of plant and wildlife resources is reaching increasingly worrying proportions. In Senegal these resources have declined drastically. Natural forest stands shrank by almost 80 000 ha per year between 1980 and 1990 (Ministry of the Environment and Nature Protection, 1997). Wildlife has been reduced so severely that medium-sized and large wild animals are now found only in reserves and national parks. Despite the classification of protected areas (2.2 million hectares), reserved forests (4 million hectares) and arable land (3.8 million hectares) and the designation of 7.5 million hectares as protected for multiple use, including biodiversity conservation (Ministry of the Environment and Nature Protection, 2001; Directorate of Water, Forests, Hunting and Soil Conservation, 2003), pressure on natural resources in Senegal is increasing. Livestock pressure is often stressed in this connection. 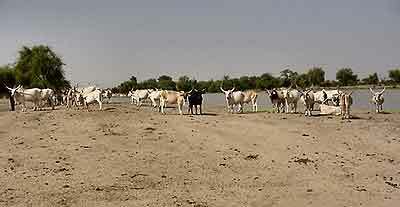 Negative effects attributed to livestock production include overgrazing, the illegal cutting of woody species for fodder during the dry season, the setting of bush fires to encourage off-season grassy regrowth, soil erosion from the trampling of soil by livestock and competition with wild animals for food and water. For this reason there is a grazing ban (albeit not enforced) on ruminant herds in national parks. However, livestock can also have a beneficial effect on the environment, including protected areas. Grazing animals can improve vegetation cover by distributing seeds with their hooves and in their excreta. They can curb the growth of undesirable shrubs, break up clods of earth and remove excess biomass that could otherwise feed bush fires. These activities encourage new grass shoots and foster seed germination, and may thus improve the quality of soil and vegetation (Steinfeld, de Haan and Blackburn, 1997). It is therefore necessary to replace bad grazing practices that harm the environment with coordinated, integrated approaches to natural resource management. In response to this concern, the Government of Senegal set up the Project for Integrated Ecosystem Management in Senegal (Projet de gestion intégrée des écosystèmes, PGIES) (see www.pgies.net) to promote better management so as to re-establish the balance of production systems and to encourage community involvement in natural resource management. The project promotes intensification and diversification of production as a means of making livestock farming less detrimental to the environment. This article describes the strategy of PGIES for working with communities in and around protected areas to modify livestock production, for improved conservation of natural resources. It also spells out necessary conditions for sustainable natural resource management such as legal access to land, appropriate policy choices, adequate institutions, capacity building and the establishment of new markets. Finally, it highlights some of the achievements of PGIES to date. Concepts regarding the management of protected areas have evolved considerably over recent decades (Ministry of the Environment and Nature Protection, 1998). Early regulations, during colonial times and just after independence, removed protected areas from the control and use of local communities and placed them under the forest administration. These areas were for the most part inhabited, used and managed by indigenous people, and the curtailment of their rights led to latent and sometimes open conflict. The repressive character of this legislation was displayed either in the expulsion of inhabitants from protected areas (as in the case of national parks) or in levies, fines or more severe sanctions (as in the case of reserved forests and wildlife reserves). Later, certain activities such as the gathering of wood, honey and fruit were permitted, but under strict supervision. Since 1997, the National Environmental Action Plan has given priority to new approaches to development and management of natural resources based on empowering local people with regard to planning, management and monitoring (Ministry of the Environment and Nature Protection, 1997). The focus today is on shared management, with the local community having partial control over management of protected areas and their benefits. The co-management proposed for protected areas in Senegal is a first in the Sahel region, and the success of the experiment will allow the authorities to modify laws and regulations governing the management of these areas. The Project for the Integrated Management of Ecosystems in Four Representative Sites in Senegal was developed by the Ministry of the Environment and Nature Protection with assistance from the Global Environment Facility (GEF) and the United Nations Development Programme (UNDP). It began its first three-year phase in March 2003. The four selected sites – the Ferlo Wildlife Reserves in the central north, the Niokolo-Koba National Park in the southeast, the Niayes coastal ecosystems along the northern coast and the Saloum Delta National Park in the central southwest – are representative of the country’s three main types of ecosystem, encompassing forest, silvipastoral, and coastal and littoral ecosystems. PGIES tests a model for integrating conservation with development. Each site comprises three different but linked spatial entities: protected areas, community nature reserves and village lands. In the past, the management of these areas had been organized through a host of often contradictory sectoral directives. ecotourism, fodder gathering, livestock grazing and the gathering of fruit will be carried out in multiple-use firebreaks according to rules accepted by all parties. The benefits from such conservation and management would be shared equitably among the local communities and the forestry administration. Elsewhere, particularly in East Africa, there has been considerable progress in decentralizing wildlife management and in sharing the benefits (Ottichilo, 1996). Community forestry is to be promoted in newly created community nature reserves in the buffer zones immediately adjacent to protected areas. Management plans for these reserves will take the existing plans for village lands and protected areas into account. Various systems for sustainable harvesting of wood, non-wood forest products and fishery resources, techniques for managing grazing areas and diverse forms of ecotourism will be tested. For village lands, the project will help villagers to draft and implement land development plans and will demonstrate techniques to intensify agricultural production and diversify income. Other activities will include strengthening of local institutions and capacity building in conflict resolution and participatory monitoring. ensure participatory monitoring and evaluation of ecosystems. The basic idea of the project is to test and demonstrate sustainable management models so that they can be replicated. The underlying hypothesis is that the intensification of agricultural, livestock, forestry and fishery production and the diversification of income at the village land and community nature reserve level will greatly reduce the pressure on natural resources in protected areas. In addition, illegal logging is expected to be better controlled since local people will have powerful economic reasons for adhering to the management rules established. On the project sites, livestock farming is extensive. In the traditional ruminant management system, herds have been left to grow spontaneously, with no genetic selection. This results in an excessive number of males, cows without milk and cases of inbreeding. Cows are milked once a day, calves are weaned very late, and food supplements and veterinary inputs are limited. These factors all lead to irregular growth and uneven milk production, which is aggravated in the dry season, when milk often dries up and cattle commonly lose weight. Poultry traditionally range freely and performance is therefore poor: sexual maturity is delayed, annual production is only 40 to 60 eggs per hen (compared with 180 to 240 eggs per hen with genetically improved stock and better rearing conditions) and the poultry mortality rate is high. On-site discussions were held with inhabitants and leaders of local non-governmental organizations, farmers’ organizations, decentralized technical services and various natural resource management projects to develop proposals for improving existing techniques and introducing simple and accessible alternatives (Ba Diao et al., 2003) (see Table). The proposals take farmers’ traditional knowledge into account, along with suggested new techniques and technologies resulting from research and development projects. An intensification of production should help in creating added value and thus ease the pressure on the ecosystems that are to be conserved. Some reduce environmental degradation by easing direct pressure on natural resources. For example, developing ponds and building check dams to collect runoff will make more water available and thus lead to a better distribution of livestock in grazing areas. Some improve natural resources by making them more productive or richer – for example the reintroduction of suitable fodder species to improve grazing land, and the establishment of fodder banks (monocultures of legume, grain or woody forage species planted to supplement the natural vegetation). Some economize the use of natural resources by increasing returns from the same resources or achieving the same returns from fewer resources. For example, improvements in product processing systems, especially for milk, will lead to increased yields. Some recycle waste into products. For example, the technique of processing straw for cattle feed not only helps to process crop residues into meat but also reduces methane emissions. Similarly, the use of agricultural and agro-industrial by-products as feed supplements during the dry season increases milk production, maintains or even improves the physical condition of cows and calves and also increases the quantity and quality of the organic manure used to fertilize the land. Successful community management of natural resources depends on a number of conditions. One is the modification of laws and regulations governing land tenure. 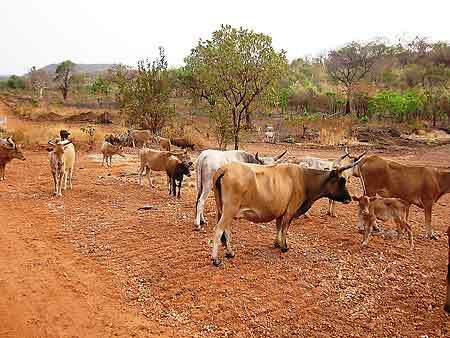 The current land tenure system favours agriculture over forestry or livestock farming: agriculture justifies exclusive use, whereas livestock farming and the management of natural forests do not. The laws need to be revised to allow effective action at the local level to balance land use systems. Intensification alone cannot reduce pressure on grazing lands if access to communal grazing resources remains unchanged. The second element is capacity building. Qualified staff are needed if the anticipated outcomes are to be achieved. The training of local people is thus of fundamental importance. Training will be supported by establishing pilot herds in certain villages and by seeking volunteers from all villages to offer their herds for demonstration of the techniques to be improved. Farmers might obtain the most expert technical assistance and advice from regional livestock agents and veterinarians, but for greater effectiveness, livestock extensionists in villages or groups of villages should be trained and kept up to date for guaranteed proximity and ongoing support. Capacity building is also needed in environmental issues, economics (trade, marketing) and good governance (rights, organizational management). Local government also needs to be strengthened. It is increasingly recognized that in the case of natural resource management, authority and responsibility should be transferred to the lowest level at which they can be exercised. The consultation and direct participation of the local community often allow local knowledge to be taken into account and responsibility to be shared, so that problems are identified and solutions found at the local level. Local or even national institutions should establish rules and methods for environmental resource management and define access to such resources. This requirement applies particularly to extensive systems, where much of the degradation is due to a lack of regulations following the breakdown of traditional institutions. Increased productivity per unit area would ease pressure on natural resources, but it is plain that this cannot be achieved solely through the development of conventional resources (natural pasture, local breeds). The livestock sector will increasingly need external inputs, especially high-quality feed, but also more productive species or varieties, better animal health and investment in livestock production techniques in general. A key element in intensification and diversification of production is market access. Development of dynamic markets can enable farms to be profitable and thus permits generation of capital for investment in soil and water protection. Lastly, effective coordination among the various projects at the various sites is essential for visibility to the local population. Between November 2003 and March 2004, three pastoral units, of 38 170, 66 420 and 79 850 ha respectively, were created in the Ferlo area with project support (Ly and Niamir-Fuller, 2004). These units were created in response to the desire to restore collective ownership of grazing resources and to preserve the mobility of herds, thus ensuring good management and sustainable use of natural resources in the fragile Ferlo ecosystems. Flexible management plans that take climatic variations into account have been drawn up and implemented. Sixteen community nature reserves have been legally established at the different project sites – five around Niokolo-Koba Park, five around Saloum Delta Park, three at the Ferlo site and three at the Niayes sites. Project support has been decisive in the control of bush fires. Village fire-fighting committees have been established and sessions have been organized to implement early controlled fires. Firebreaks totalling 368 km were created in the Ferlo zone in 2004 (Directorate of Forecasts and Statistics, 2005), and more than 100 km of firebreaks were created in the Saloum Delta between 2004 and 2005 (Ba, 2005). Existing firebreaks have been rehabilitated. Also in the Saloum Delta, the project has assisted in developing 500 ha of agrosilvipastoral systems. It has established ten operational credit and savings programmes to facilitate the funding of projects to intensify agricultural production and support income diversification. Better management of Senegal’s natural resources is essential, given their high level of degradation. The application of repressive legislation in the past several decades has not harnessed this decline. The co-management model proposed by PGIES should permit the main users of the areas in question to have a greater voice and more responsibility in environmental conservation. Livestock farming can have an important positive role in the conservation of natural resources. Grazing increases plant biodiversity through the dispersion of seeds and reduces water erosion by breaking up the soil surface, so protected areas and community nature reserves should be made accessible to domestic animals. In village lands, the integration of livestock in the production systems makes it possible to use natural resources effectively. The animals use poor agricultural produce, thus giving it value, and their waste fertilizes the soil while improving its structure, thus avoiding erosion. The PGIES programme is based on the diversification and intensification of production systems to attain the double objective of making animal production sustainable and feeding the population while conserving natural resources. It advocates improvements in traditional production techniques as well as the introduction of new technologies to provide people with sources of additional income. However, these activities must be supported through capacity building, market development, increased investment in livestock farming and the revision of laws and regulations governing the use of communal grazing land. The achievements above show that hope is justified as there are many opportunities for reducing environmental degradation while taking advantage of the vast development potential offered by livestock farming. Ba, O.N. 2005. Conservation de la biodiversité dans le Delta du Saloum: le PGIES ouvre plus de 100 km de pare-feux. Le Soleil (Dakar, Senegal), article 6480. Directorate of Forecasts and Statistics. 2005. Région de Matam. Situation économique et sociale, édition 2004. Matam, Senegal. Ly, A. & Niamir-Fuller, M. 2004. 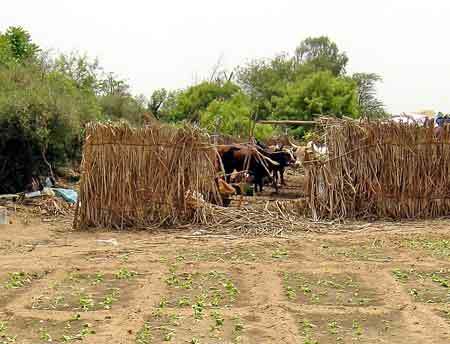 La propriété collective et la mobilité pastorale en tant qu’alliées de la conservation – expériences et politiques innovatrices au Ferlo (Sénégal). Policy Matters, 13: 162–173. Ministry of the Environment and Nature Protection. 1997. Plan national d’action pour l’environnement. Dakar, Senegal. Ministry of the Environment and Nature Protection. 1998. Programme d’action national de lutte contre la désertification. Dakar, Senegal. Ministry of the Environment and Nature Protection. 2001. Projet de gestion intégrée des ecosystèmes dans quatre sites représentatifs du Sénégal (PGIES). Project document. Dakar, Senegal. Ottichilo, W.K. 1996. Wildlife–livestock interactions in Kenya. Invited paper for the World Bank/FAO workshop Balancing Livestock and the Environment, Washington, DC, USA, 27–28 September.